Pfizer (PFE) has announced the fourth recall of its blockbuster cholesterol drug Lipitor. The largest pharmaceutical in the world said that it intends to recall approximately 19,000 bottles of Lipitor 40 mg tablets distributed in the U.S. due to reports of an "uncharacteristic odor." A medical assessment found that the risk of health consequences to patients appears to be minimal, Pfizer said. Although not as large by a long shot, Pfizer's recall woes this year are somewhat reminiscent of Johnson & Johnson's (JNJ) massive recall of children's over-the-counter medicine. Both these recalls -- as well as several from other drug companies -- started with reports of musty or moldy smells, which may be indicative of 2,4,6 tribromoanisole -- or TBA. TBA is a chemical commonly found in wood preservatives, and is often applied to pallets used to transport and store a variety of products. The U.S. Food and Drug Administration says that even if the health risks are minimal, it is concerned that patients sensing an unusual odor will stop taking their medications. After TBA was found in a competing company's product, Pfizer says it initiated a review of its supplies in January and kept particular watch for any report of a "musty" smell. "The company has taken quick action to ensure its product continues to meet the company's high quality and patient safety standards. We have identified the source of the odor, and we are enacting rigorous measures to prevent odor-related issues going forward," Pfizer said in a statement. This resulted in several lots being rejected in the first half of the year, then three recalls from August through October in response to infrequent complaints of uncharacteristic odors. In August, the New-York-based drug maker also relocated bottle production from Puerto Rico to alternate third-party plants. Still, the recalled lot was shipped prior to those changes, and others may still be on the market, requiring additional recalls. 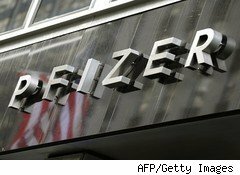 Pfizer does not anticipate the recall will cause a shortage of the best-selling drug in the world.